Last weekend, Mia and I house-sat for her parents, so we had a large kitchen and a lot of time on our hands. She suggested, and I readily agreed, that we make our own ravioli. 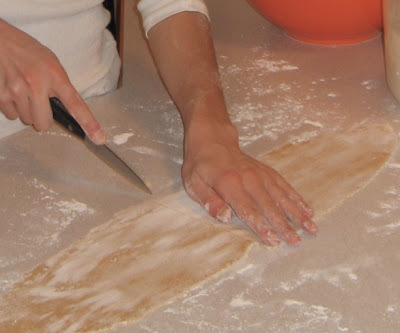 I've always been curious about fresh pasta, and fresh ravioli in particular - what is pasta made from? How do you turn pasta dough into ravioli? Why is it so delicious? Whenever I claim that pasta is made from wheat, I am corrected because it's actually made from semolina. But as it turns out, semolina is actually just a type of wheat. It is the inner, starchy endosperm of durum wheat. According to the package, semolina contains an unusually large amount of gluten, which is why you can stretch it and shape it so much without its breaking up. Satisfied with that, we moved on to the production process. Mia put the dough together (a cup of semolina, a cup of whole wheat flour, and three eggs; next time we might try a pinch of salt and a splash of olive oil) and kneaded it. Next came the fun part: rolling. Pasta is usually made with a pasta machine, which does all the dirty work for you by mechanically or electrically rolling the dough into long, lovely, paper-thin sheets. Lacking such a device, Mia rolled it out by hand with a rolling pin, which, in addition to serving as her upper-body strength training for the week, produced charmingly (?) and irregularly shaped pieces of dough. The sheets were then cut into ravioli-sized squares. We prepared three fillings - ground lamb with mint, buttercup squash with ricotta, and mushrooms and walnuts with sage, sherry, and goat cheese. We filled them - a dollop of filling in the middle, wet the edge of the pasta dough with water, and fold it over and push the ends together until they stick. Then we cooked them, 4-5 minutes in boiling water. The result was delicious. The pasta itself was tasty, chewy, and fresh. The ground lamb wasn't much of a success, but the other two fillings were superb. Mia's favorite was the squash (she's obsessed with squash), and my favorite was the mushroom-walnut - savory, earthy, and nutty. Overall a success, if rather labor-intensive. Next time we'll tweak the dough. Or make pizza instead. I highly recommend the pasta attachment for your mixer (which I have so the offer to use my kitchen still stands. Jacob is quite the pasta maker when he's home, including spinich linguine and we've even made kreplach. There is nothing like fresh pasta with a light tomato basil sauce.